Start creating and performing music with your Mac or PC with the world’s best-selling keyboard controllers: The Keystation Series from M-Audio. Start creating and performing music with your mac or PC with the world’s best-selling keyboard controllers: The Keystation Series from M-Audio. Whether you’re a seasoned pro looking for just the right controls or are looking to get started with the right USB MIDI controller, the Keystation 49 MK3 is a simple, powerful MIDI controller designed for sequencing music and playing virtual instruments on your Mac or PC. Keystation 49 MK3 features 49 natural feeling full-size velocity-sensitive keys and comprehensive controls that expand the range of playable notes, expressive capabilities, and enhance your recording workflow. 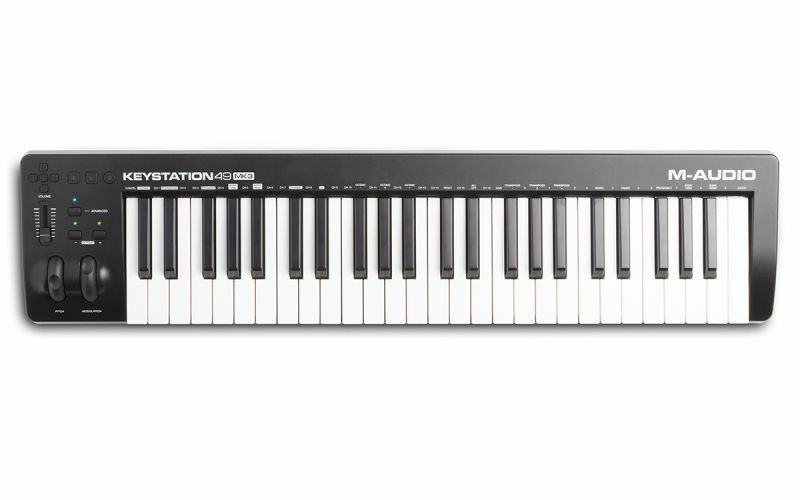 With Keystation 49 MK3, maximizing your creativity while minimizing the complication is easy: Use the fully assignable octave range buttons; pitch-bend and modulation wheels; volume slider, and transport and directional controls to play, perform, and record with your music software without using a mouse or trackpad. Keystation 49 MK3 also features a 1/4” (6.3mm) sustain pedal input that lets you use an external control pedal, such as the M-Audio SP2 (sold separately), for genuine piano sustain. 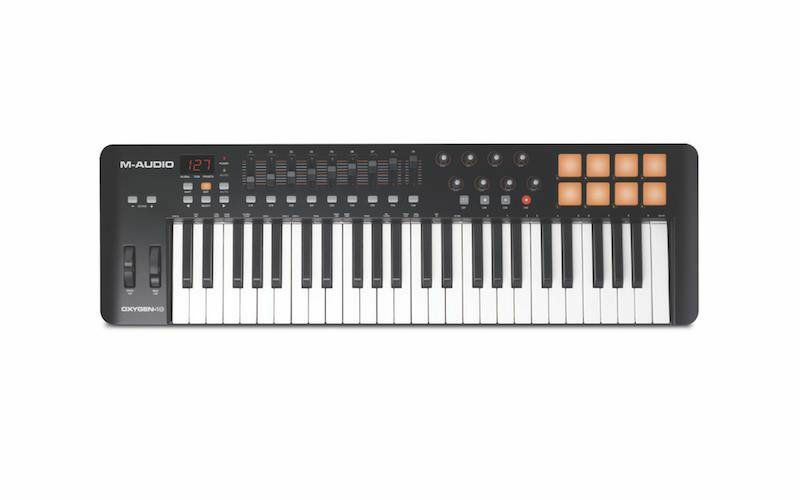 Compact, lightweight and durable, Keystation 49 MK3 is perfect for traveling musicians who want to take command of music software during live performances or for producers who wish to add an intuitive MIDI controller with a natural feeling keybed to their studio—it easily satisfies both roles. For an easy-to-use and portable setup, Keystation 49 MK3 is USB-powered, class-compliant, and supports USB-MIDI connectivity. Plus, Keystation 49 MK3 supports iOS connectivity with the Apple Lightning to USB Camera Adapter (sold separately), enabling you to perform and compose with audio apps on your iPad and other iOS devices. Pro Tools | First M-Audio Edition is included with the Keystation 49 MK3. Pro Tools is the industry standard for recording software and the teams at M-Audio and AVID have crafted a version of this terrific collection specifically tailored for M-Audio hardware. This amazing audio and MIDI recording software helps inspire any artist, musician or singer-songwriter to create, record and share all their ideas across the world at any time. Pro Tools | First M-Audio Edition features Unlimited Busses, Elastic Time and Elastic Pitch, Offline Bounce and 1 GB of free cloud storage space for collaboration or accessing your projects from any computer anywhere that is connected to the internet, plus compatibility with all the included AIR Music Tech Virtual Instruments. This truly amazing software recording package is primed to get your ideas out of your imagination and amplified into the world. Enjoy! Ableton Live Lite is one of the most popular performance and production programs available in the world. A powerful music creation tool, Ableton Live Lite enables musicians and producers to spontaneously compose, record, remix, improvise, and edit musical ideas in a fluid audio/MIDI environment. Explore sonic possibilities in real time whether on stage or in the studio. When you are satisfied with your work, Ableton Live Lite lets you save it or mix it down. AIR Music’s Mini Grand is a simple-to-use yet powerful virtual piano instrument with seven different acoustic piano sounds to suit a broad range of musical styles and production needs. Combining premium quality piano samples, innovative re-pedaling technology, built-in room simulation and equal and stretched tuning, Mini Grand is the go-to plugin for authentic, emotive piano sounds. AIR Music’s Velvet is a virtual electronic piano that combines five legendary electric pianos from the 60s and 70s into one versatile instrument. Based on the Fender Rhodes Suitcase, Fender Rhodes MK I and MK II Stage Pianos, Wurlitzer 200A and Hohner Pianet-T, Velvet accurately emulates the sound quality, response and nuances of each original instrument to bring your piano tracks to life. AIR Music’s Xpand!2 is a multitimbral workstation offering four active sound slots, or parts, per patch. Each part is provided with its own MIDI channel, Note Range (Zone), Mix, Arpeggiation, Modulation, and Effects settings—an excellent method for creating individual parts. Harnessing the four parts together to build one amazing Patch is where Xpand!2 reveals its true power. Using everything from wavetables and FM synthesis to sample playback, the expert sound design team at Air Music Tech has carefully created thousands of ready-to-play Xpand!2 patches. With Skoove, you’ll learn to play piano with hundreds of interactive, high-quality online piano lessons structured for beginner, intermediate and advanced players. Skoove’s unique method guides you with real-time feedback as you play, letting you hone your skills faster and learn everything you need to become a complete piano player. Join over 100,000 musicians building their skills with Melodics. Melodics is a desktop app that teaches you to play and perform with MIDI keyboards, pad controllers, and drums. Whether you’re just starting out, or a seasoned pro looking to learn advanced techniques, Melodics grows with you. It comes with over 60 free lessons (Including 5 Exclusive to M-Audio) to get you started! Chop up and mix 2 gigs of samples ranging from deep ambient synth pad loops to vintage drum one shots. These are all designed to inspire your music production and provide professional sounding samples that will shine in your mix. Touch Loops perfectly captures the tone and intensity of each sample, so they enhance and complement any song, wherever you use them. This incredible value can be found in your M-Audio account, ready to be downloaded and chopped to your liking! M-Audio pioneered the portable MIDI controller market with the Oxygen series of keyboard controllers. Today, M-Audio continues to be a leader of this technology by developing intuitive controllers for software-based music production and performance. Thanks to continued innovation over the course of nearly a decade, the new Oxygen series controllers offer more control, deep hardware/software integration, and come equipped with a reliable build that enables you to make music on the go or implement these controllers into any studio. With an array of assignable knobs, pads, and faders, Oxygen 49 gives you total control over your software, allowing you to stay engaged in the creative flow of recording and mixing music without ever reaching for the mouse. It features 49 velocity-sensitive keys for playing chords, bass lines, and melodies; eight assignable knobs for tweaking effect plugins and virtual instruments; eight velocity-sensitive pads for triggering samples or finger drumming; and nine assignable faders for mixing tracks together and controlling the master output. Oxygen 49 also has dedicated transport controls and track-up and -down buttons that allow you to initiate play, stop, and record in the DAW environment right from your keyboard controller. The Oxygen 49 MIDI controller offers out-of-the-box integration with popular DAWs including Ableton Live, Pro Tools, Logic, Cubase, and many more. Using DirectLink, Oxygen 49's controls instantly map to key parameters in your favorite DAW, enabling you to immediately tweak the mixers, editors, and transport windows. Additionally, Oxygen 49 has built-in customizable mapping presets that quickly interface Oxygen 49 with your favorite effect plugins and virtual instruments. Setting up a MIDI controller with your software doesn’t get any easier than this. Ableton Live Lite is included with Oxygen 49 for immediate music creation. One of the most popular performance and production programs available in the world, Ableton Live Lite is a powerful music creation tool that enables musicians and producers to spontaneously compose, record, remix, improvise, and edit musical ideas in a fluid audio/MIDI environment. Host plugins and use Oxygen 49 to produce, compose, or perform all within Ableton Live Lite. When you are satisfied with your work, Ableton Live lets you save it or mix it down. SONiVOX Twist is a spectral morphing synthesis virtual instrument. Comprised of a dynamic interface, an advanced pattern generator, and onboard effects, Twist lets you create serious sounds using simple controls. Two swirling sound layers provide unique harmonic controls and form the basis of every patch. Sculpt your sound with a multi-mode filter, independent amp and filter envelope generators, and a LFO that can be sync’d to tempo. Xpand!2 is a multitimbral workstation offering four active sound slots, or parts, per patch. Each part is provided with its own MIDI channel, Note Range (Zone), Mix, Arpeggiation, Modulation, and Effects settings—an excellent method for creating individual parts. Harnessing the four parts together to build one amazing Patch is where Xpand!2 reveals its true power. Using everything from wavetables and FM synthesis to sample playback, the expert sound design team at Air Music Tech has carefully created thousands of ready-to-play Xpand!2 patches. Ableton is a trademark of Ableton AG. Cubase is a registered trademark of Steinberg Media Technologies AG. Pro Tools is a registered trademark of Avid Technology, Inc. in the U.S. and other countries. Logic is a trademark of Apple Inc., registered in the U.S. and other countries. M-Audio is a trademark of inMusic Brands Inc., registered in the US and other countries. inMusic is the exclusive distributor of SONiVOX. All other product or company names are trademarks or registered trademarks of their respective owners. With an array of assignable knobs, pads, and a fader, Oxygen 25 gives you total control over your software, allowing you to stay engaged in the creative flow of recording and mixing music without ever reaching for the mouse. 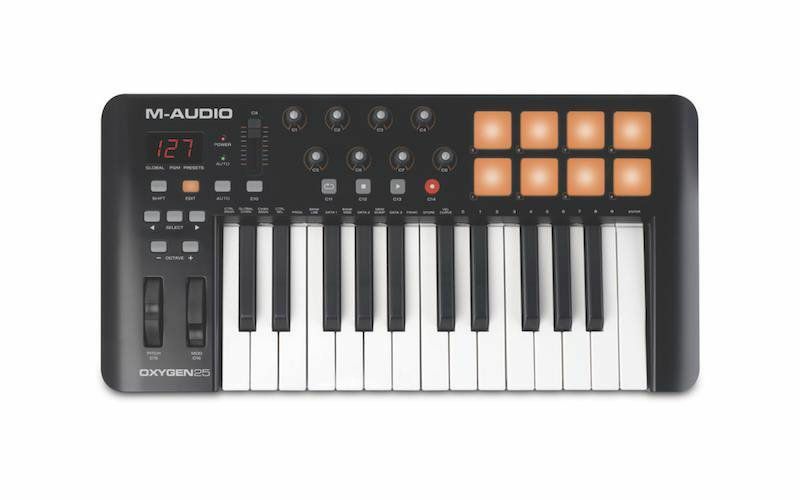 It features 25 velocity-sensitive keys for playing chords, bass lines, and melodies; eight assignable knobs for tweaking effect plugins and virtual instruments; eight velocity-sensitive pads for triggering samples or finger drumming; and an assignable fader that is ideal for controlling the master output or mixing tracks together. Oxygen 25 also has dedicated transport controls and track-up and -down buttons that allow you to initiate play, stop, and record in the DAW environment right from your keyboard controller. The Oxygen 25 offers out-of-the-box integration with popular DAWs including Ableton Live, Pro Tools, Logic, Cubase, and many more. Using DirectLink, Oxygen 25's controls instantly map to key parameters in your favorite DAW, enabling you to immediately tweak the mixers, editors, and transport windows. Additionally, Oxygen 25 has built-in customizable mapping presets that quickly interface Oxygen 25 with your favorite effect plugins and virtual instruments. Setting up a MIDI controller with your software doesn’t get any easier than this. Ableton Live Lite is included with Oxygen 25 for immediate music creation. One of the most popular performance and production programs available in the world, Ableton Live Lite is a powerful music creation tool that enables musicians and producers to spontaneously compose, record, remix, improvise, and edit musical ideas in a fluid audio/MIDI environment. Host plugins and use Oxygen 25 to produce, compose, or perform all within Ableton Live Lite. When you are satisfied with your work, Ableton Live lets you save it or mix it down.